Samford University is commemorating the 50th anniversary of integration during the 2017-18 academic year with a series of special events and recognitions. The commemoration kicked off during recent homecoming weekend and will continue through the spring semester. A special highlight of the commemoration will be the recognition of African-American Samford alumni and students with the Golden Anniversary Achievement Honors during the month of February. To qualify, nominees must have completed at least one academic year enrolled at Samford University. Nominations are being accepted through Nov. 27 using the form here. Any member of the Samford community can nominate individuals who have distinguished themselves through exemplary professional achievement and civic and community service. A representative committee including alumni, faculty, staff, and students will review the nominations and select 28 individuals to be recognized throughout the month of February in timing with Black History Month. 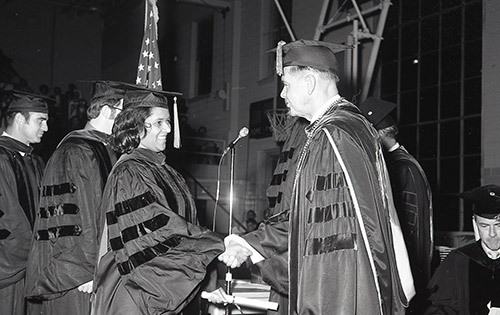 In 1967, the late Audrey Lattimore Gaston enrolled in Cumberland School of Law and became the first full-time, African American student at Samford. Gaston ushered in a new era for Samford, one that the university is proud to celebrate, according to Denise Gregory, Samford’s director of diversity and intercultural initiatives. In 1969, the late Elizabeth Sloan became the first African-American undergraduate to live on campus. That same year Samford became the first major university in Alabama to integrate its sports teams when three African American junior-college transfers—Sherman Hogan, Otha Mitchell, and Billy Williams—joined the basketball team. The year-long commemoration kicked off during recent homecoming weekend at the Leadership Forum for members of Samford’s board of trustees, board of overseers, advisory boards and other leadership groups. “This year, even as Samford celebrates the golden anniversary of full integration—as always—we remember that we stand on the shoulders of those who came before. We sit in the shade of trees we did not plant,” Samford President Andrew Westmoreland told the audience of about 250 university leaders. Westmoreland noted that almost 2,000 have earned Samford degrees over the past 50 years and have gone on to achieve success in medicine and science, business, ministry, education, the arts and politics. Other special highlights during the year include the annual Thurgood Marshall Symposium hosted by Cumberland School of Law Feb. 15 and the Tom and Marla Corts Distinguished Author Series March 1, hosted by Orlean Beeson School of Education and featuring 1996 Samford alumnus Eric Motley. Billie Jean Young, a 1979 Cumberland graduate, will perform her one-woman show, “Fannie Lou Hamer: This Little Light” Feb. 13, and New York Times bestselling author Andrew Maraniss speaks Feb. 27. Maraniss' book Strong Inside is the civil rights story of Perry Wallace, the first African American basketball player in the Southeastern Conference.